Jess Williams and Oscar Merry were early adopters in the world of voice technology. They recognized the unique opportunities voice presents for content creators and developers, which led them to publish some of the most engaging and profitable skills in the Alexa Skills Store. 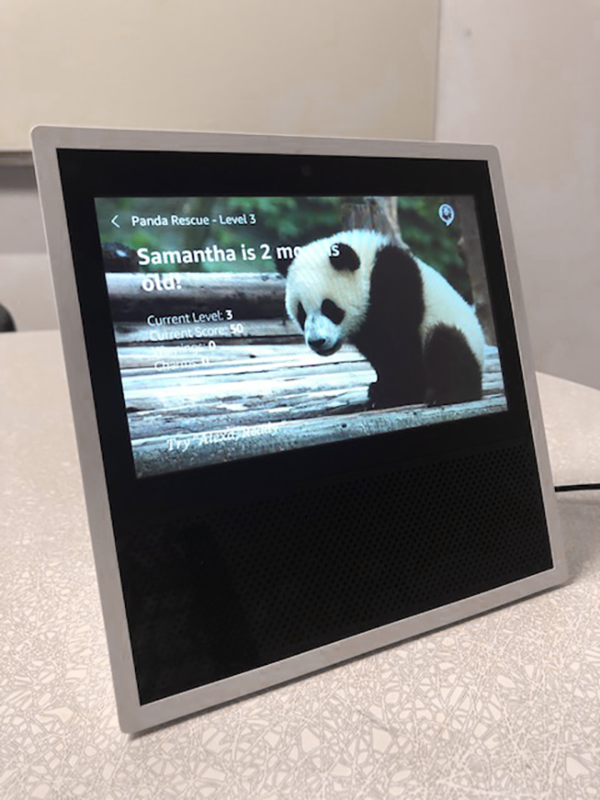 With the introduction of Echo Show, which is an Echo device with a screen, they wanted to seize this new opportunity to further enrich the voice experience with their Alexa skills. Williams and Merry continue to make great strides building skills for Alexa. Most recently, they’ve leapt into building voice-first experiences for Echo devices with screens. Their first skill for Echo Show was a kid skill called Panda Rescue, which won the $7,500 cash prize for Best Skill Designed for Echo Show in the Alexa Skills Challenge: Kids. Panda Rescue is a game that gives kids the experience of raising an orphaned baby panda until it is able to survive on its own. Co-founders of Opearlo, the voice design and development studio, Merry and Williams have built Alexa skills across a number of categories. Many of these—including Guess my Name, Riddle of the Day, Find My Phone, and Inspire Me—earn money from the Alexa Developer Rewards program. But they’d never ventured into the kids gaming category. That all changed when Amazon announced support for Alexa kid skills, which enabled skill developers to reach the next generation of customers, as well as the Alexa Skills Challenge: Kids. The Panda Rescue skill begins with a baby panda rescued from the wild. The player then raises the panda, watching it learn and grow through 10 levels of the game, until the panda is finally fit for the child to release back into the wild. As a standalone voice experience, Panda Rescue provides an engaging plot with custom audio, unique voices using Amazon Polly, and music to keep kids engaged. For example, the sound effects of the panda refuge and the forest create a more immersive experience as the user progresses through the levels. With Echo Show, the skill uses compelling imagery to enhance the story, making it more immersive without detracting from the voice-first experience. For example, the voice component teaches kids that pandas are born pink and without any fur. Echo Show lets kids actually see the baby panda and watch as it grows up. 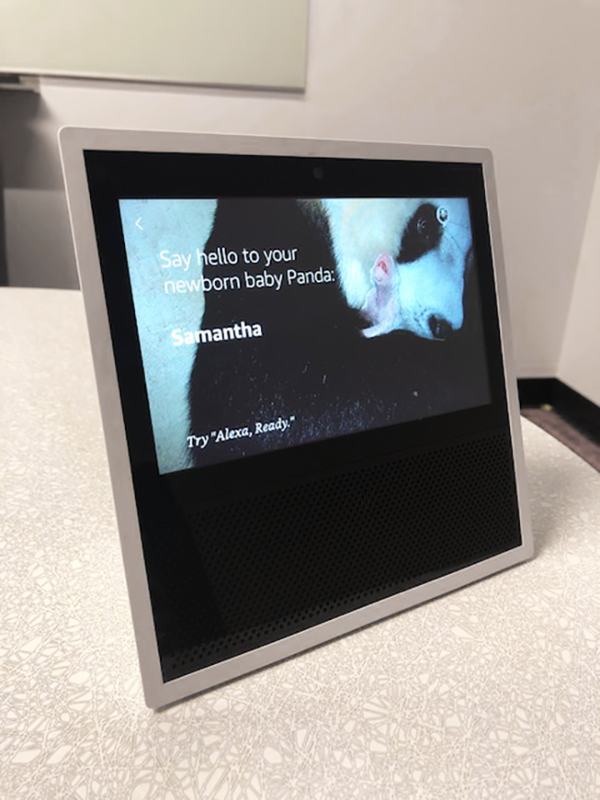 For Echo Show and Echo Spot, developers can create engaging voice-first experiences, then enhance them with visual aspects like imagery or videos. Even so, Merry and Williams are adamant that when building a voice experience for Echo devices with screens, voice—not visuals—must remain the primary interaction. Merry also emphasizes that the visuals displayed on Echo Show should enhance—not detract from—the voice interaction. After observing customers using skills on Echo Show, Merry and Williams noticed customers can become distracted by what’s displayed on the screen, rather than what’s being communicated via voice. The interaction model and responses for skills on devices with screens require more thought than developing for audio-only skills. 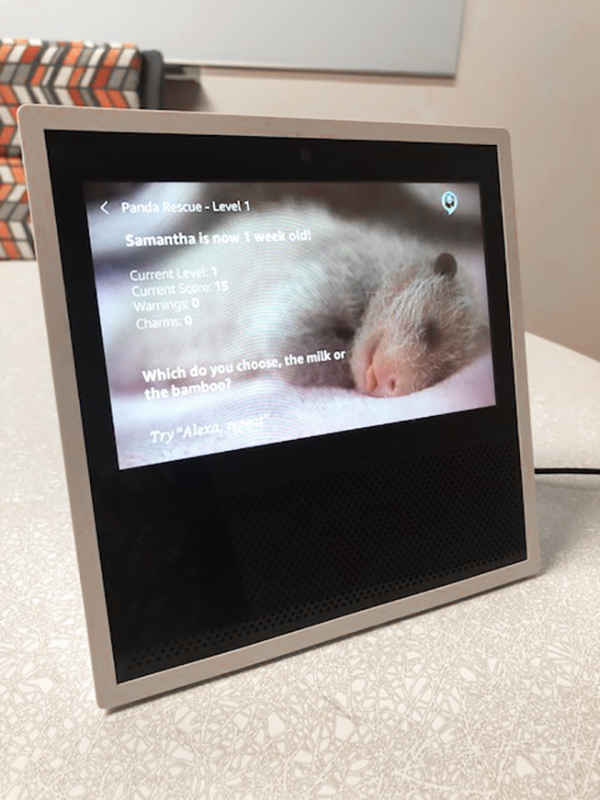 That’s why with Panda Rescue and other skills for Echo Show, Williams and Merry design the conversation between Alexa and the customer first, before deciding on the type of imagery and when to show it. While images and even video can enhance the user experience, they are careful it doesn’t distract the customer from the audio. Williams sees Echo devices with screens as an opportunity to stretch her voice design limits to create even more engaging user experiences. Merry agrees with the enormous potential that voice-first experiences will bring to both customers and developers alike. Bring your big idea to life with Alexa and earn perks through our tiered rewards system. US developers, publish a skill in June and earn an AWS IoT button. Add in-skill purchasing to any skill in June can earn an Alexa-enabled device for the car. If you're not in the US, check out our promotions in Canada, the UK, Germany, Japan, France, Australia, and India. Learn more about our promotion and start building today.